A Burmese woman waits to be taken back to Myanmar from a refugee camp in Thailand. 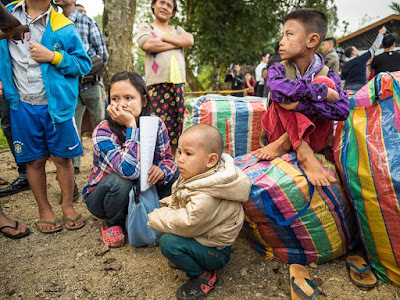 Thailand repatriated a handful of Burmese refugees this week. About 65 people from the "Nupo Temporary Shelter," a refugee camp in Tak province, about five hours south of Mae Sot, were voluntarily returned to Myanmar. It's a proverbial drop in the bucket for the total refugee community though. There about 11,000 refugees in Nupo and about 150,000 Burmese refugees in camps up and down the Thai-Myanmar border. In the Nupo camp, a refugee walks past a vendor selling produce. Myanmar has been wracked by decades of political violence. 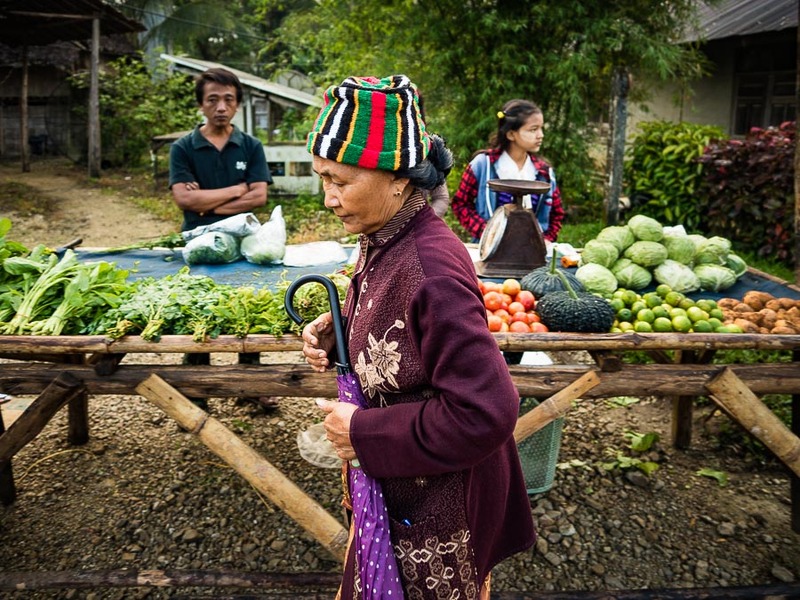 Most of the refugees in Tak province are Karen people, one of Myanmar's ethnic minorities. The Karen have been waging a guerilla war against the central government since shortly after Burmese independence. People displaced by the fighting have flooded into Thailand. Political unrest in 1988 forced thousands more people from central Myanmar to flee fighting and exploded the refugee population in Thailand. 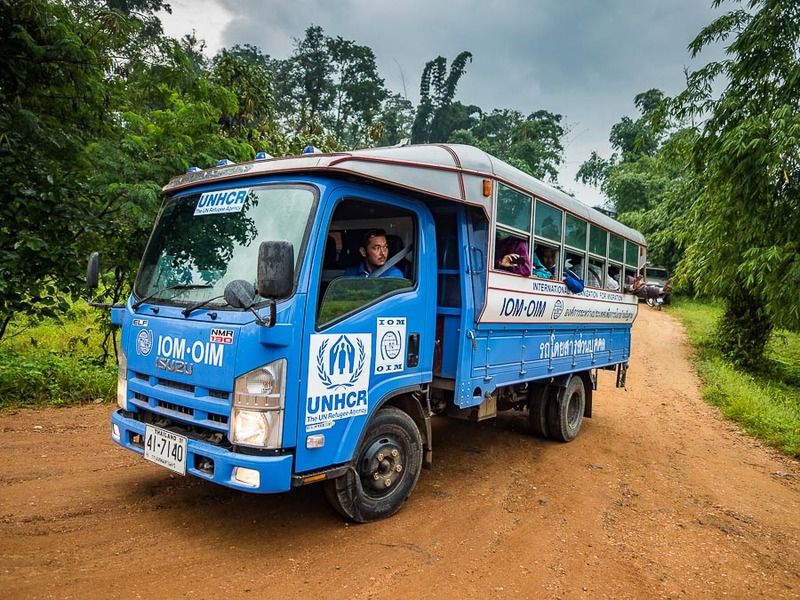 Recent democratic reforms and an improving economy in Myanmar coupled with less fighting in the Karen areas, means it might be possible for some of the refugees to return. And Thailand is eager to have them go back. A refugee family waits to board the bus that will return them to Myanmar. I traveled out to Nupo camp and across the border to the refugee resettlement center in Myawaddy, Myanmar, to document the repatriation. It's normally difficult to get access to the refugee camps, but in this case media coverage was welcomed. 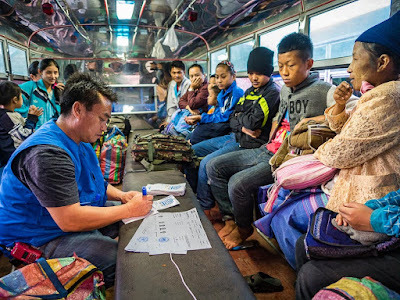 An official with the International Organization for Migration (IOM) helps returning refugees with last minute paperwork. On one hand, this was a publicity effort by the Thai government and refugee support groups but on the other hand this was the first step of a long process of resettling the refugees. The refugee situation has been a thorn in the side of Thai governments for a very long time. 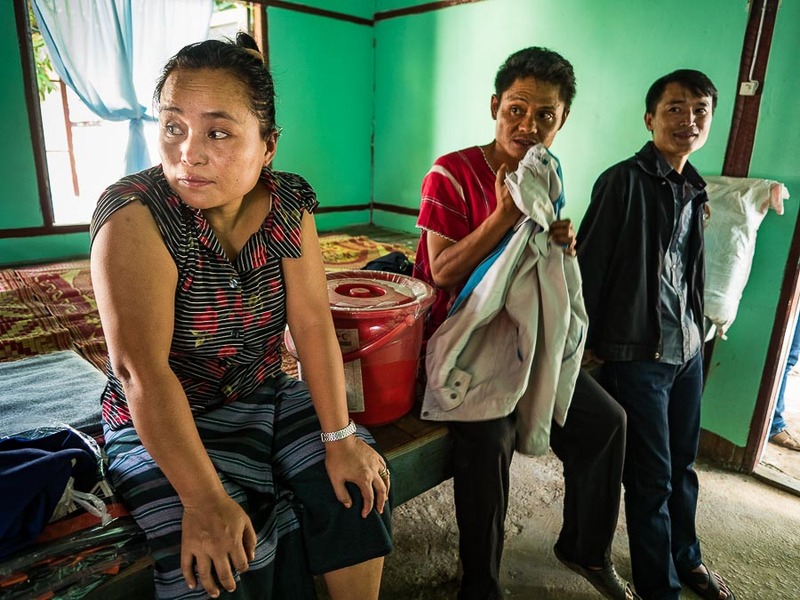 There have been Burmese refugees along the border since the 1960s, but refugee numbers soared in the 1980s as an already unstable situation in Burma crumbled. Burma wasn't the only source of refugees in Thailand. Hundreds of thousands of Cambodian refugees came to Thailand in 1970s fleeing the murderous Khmer Rouge and another wave came in the 1980s fleeing civil war (sparked by the Vietnamese invasion of Cambodia). There was a smaller number of Lao refugees, fleeing the communists in Laos, along the Thai-Lao border. 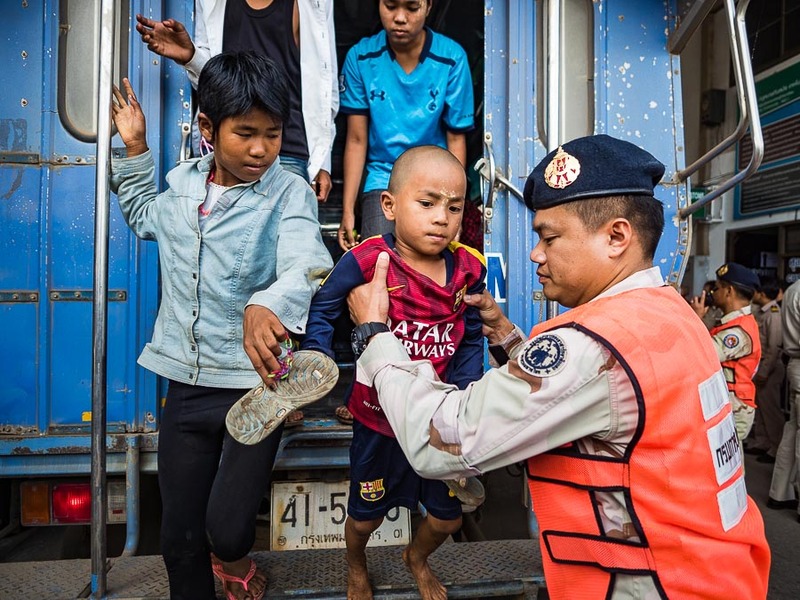 At one point, Thailand's borders were ringed by refugee communities. A returning refugee with his life's possessions in a vinyl bag. Thai defense volunteers help a woman and her child board a bus. I don't think the Thais were happy about the refugee camps on their borders, but I have to give them credit. They stepped up and did the best they could. Compared to the shameful response Middle Eastern refugees are getting in Europe and the US and the disgusting greeting Central American children fleeing violence in El Salvador and elsewhere got from Republican leaders in the US, the Thai response was positively enlightened. The Cambodian camps were closed more than a decade ago and the last camp for Lao refugees was closed about three years ago, leaving only the Burmese camps. Leaving is bittersweet. 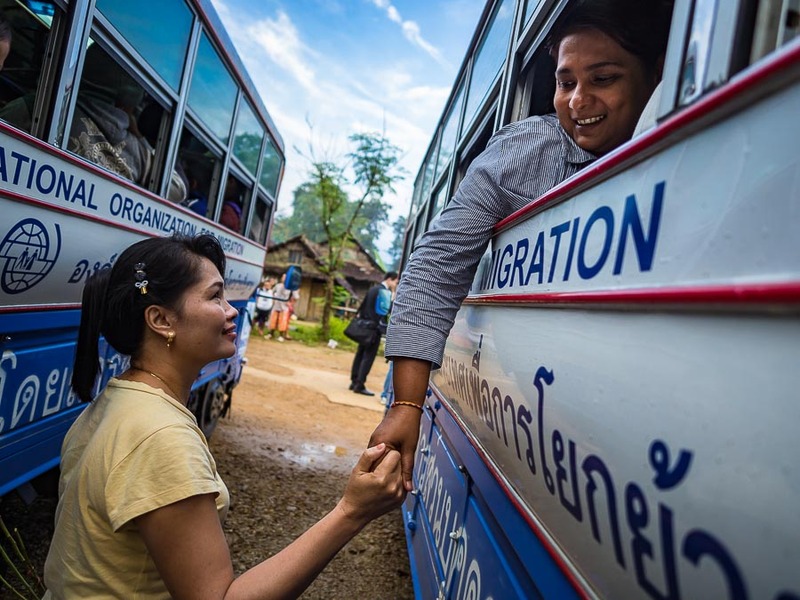 A woman going back to Myanmar (in the bus) says goodbye to a friend remaining in the camp. This repatriation was voluntary - no one was forced to go back. Repatriating the Burmese is going to be a monumental challenge. Many have been in Thailand for decades and have never lived in Myanmar. As people left their homes, the land was occupied (or confiscated) by Burmese generals and their cronies. Squatters moved into homes in urban areas. The refugees are returning to an uncertain future. A bus full of refugees leaves the Nupo camp. Burmese refugees in Thailand have a difficult life. They're confined to the camps and not allowed to work outside the camp. The UNHCR and NGOs provide rations, medical needs and schools but as Myanmar has democratized and "normalized" rations and budgets for the camps have been cut. Although the border region is relatively peaceful now, it was only a couple of years ago that the Burmese army (or militias allied with the army) would periodically send mortar rounds into the camps to harass the residents. People don't become refugees on a whim. In Mae Sot, at the border crossing to Myanmar, a Thai defense volunteer helps a family off the bus. Refugees (and the media) attended a short ceremony before the refugees got back on the buses to go to the reception center in Myawaddy. 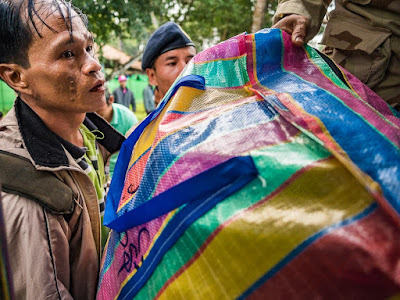 Although the repatriation was completely voluntary (initially we were told more than 90 people would be rapatriated but by the time the buses left the camp the number was down to about 65), you could see that there was a sense of apprehension. Some people were smiling as they boarded the buses but no one was celebrating. 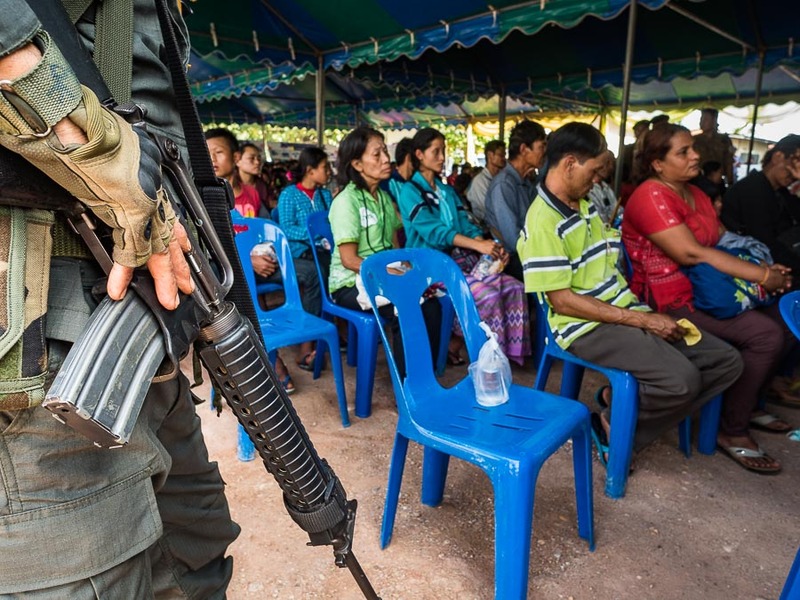 In Myawaddy, the refugees were met by armed militia members who watched over the proceedings. A soldier in the Border Guards Force (BGF), a pro-government militia, watches returning refugees at the Myawaddy reception center, a few years ago they were enemies. There was a large Thai military and law enforcement presence in the camp and at the border crossing. The Thai police had their handguns, but the soldiers were unarmed. The BGF soldiers were fully kitted out with assault rifles and grenade launchers. Life in the reception center in Myawaddy won't be easy for the returning refugees. In the Thai camps they lived in thatched huts, but each family had a modicum of privacy in their own hut. In the reception center, families are housed in long, roomless buildings, each family separated from the other by just a curtain. 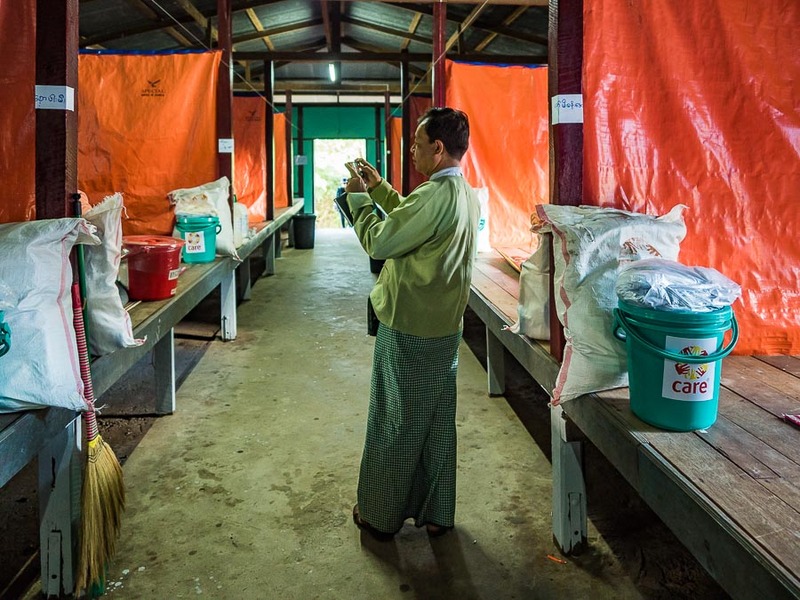 A Burmese government official walks through the living spaces in the reception center. One family lives on the raised platforms between the orange curtains. About 10-12 families live in the building. A family looks over their new home in the resettlement center. There are more photos of the repatriation in my archive or available from ZUMA Press.